Eating out in Manhattan as we have along our search for the best burger in NYC, we’ve run through our share of “hot-spot” dining destinations. From the “of-the-moment” sort to the “secret menu” type, you can take a twist around a corner, turn down an alley, or step through a telephone booth, and you’re in the latest restaurant carrying proverbial buzz. Among those that have resonated such chatter is our latest review, The Little Owl. Set in Greenwich Village and serving up quintessential American plates created by Chef and Owner Joey Campanaro, the unassuming 28-seat eatery is known for, among other things, its tasty burger. When we first started Burger Bedlam, The Little Owl was on our initial list of “places to review,” yet the wait (typically 1-1.5 hours) and hard to come by reservations kept us from making our way to Bedford St. Nevertheless, after enduring the 90 minute wait on a recent Sunday morning, our dreams became reality. 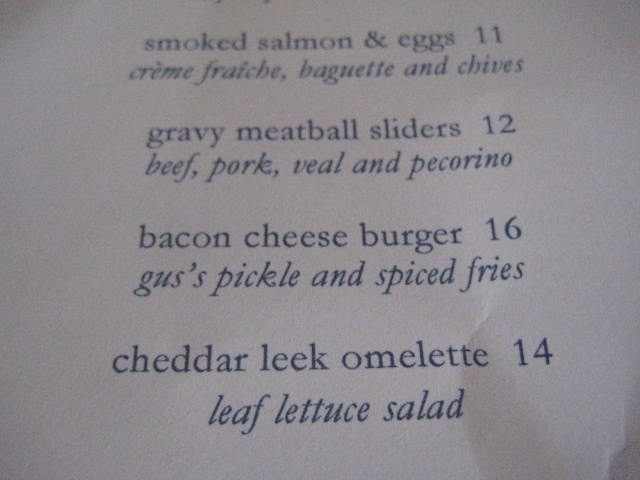 Our Expectations: The Bacon Cheeseburger. An eight ounce short rib and brisket blend topped with aged cheddar and maple-cured bacon all on a house-made bun. Chef Campanaro chose to pack quite a lot of potential taste with both a hefty serving of fat and grand size of the patty. Our cohorts among the “burger expert” community rave about this one – and with apparently good reason – but we’re happy to take a “bite” at contributing some analysis. Meat: Right off the bat, we can exclaim that the taste of this burger’s blend is glorious…but with one MAJOR caveat – holy salt Batman! Pardon the superhero reference, but we weren’t sure how to phrase the overwhelming amount of saltiness we had to deal with. As we bit, chewed, and devoured, the need for water refills became more and more grandiose. But, in spite of the “saltlick” attack, the char was excellent, the meat was supremely fresh, and the cooking execution was perfect. The juices were flowing and outside of the salt, we enjoyed what we ate. In a word, we’d have a major “beef’ with this patty if those redeeming qualities didn’t exist. Toppings: The maple-cured bacon warmed our hearts with a sugary and savory blend of goodness while the aged Cheddar smothered the burger like a Snuggy – just the right amount and touching every edge. Though, we were disappointed with the minimal use of the scrumptious bacon, a rather paltry serving. Bun: While we can’t claim it to be “magical” as our counterpart Ed Levine exalted in his review, the best part of The Little Owl’s burger may have been this house-made bun. Great texture, fresh and slightly sweet, the juices were captured artfully as we ate. Too often the buns of a sizable burger succumb to the forces of physics and fall apart instantaneously. Yet, Chef Campanaro applied great vision to construct a worthy ally to his patty. However, the one negative we point out is the extreme amount of bun you need to consume in order to take down the eight ounce patty. It’s far too much. Meat (41): Fresh, flavorful but salty as hell. Dial it down and you’ve got a better rating here. A clear casing and nice char, but the incessant need for water was too much to overcome. Toppings (23): Delectable bacon, but not enough of it. Cheddar was draped masterfully but not overdone with too copious of a serving. Bun (24): Hard to beat the construction of their house-made bun, despite its size. Had we eaten a slightly smaller patty, the score might reflect perfection. Regardless, it was the best part of the experience. 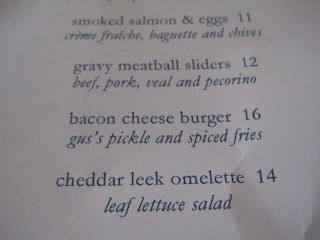 Had brunch here today and I absolutely LOVED the burger!! One of the best for sure! Something told me to get the burger instead of the usual eggs Benedict and i am SO happy i did. Was skeptical, but that first bite sent me straight to Burger Heaven! I do agree that it is incredibly salty and I've been craving water all day, but it was worth it. I've had the burgers at many of the places you reviewed and agree with most of your comments ( for ex. blue 9 was great when it opened, last time it was terrible) and look forward to trying some of the ones I haven't yet had. Keep up the good work.